What we call the beginning is often the end / And to make an end is to make a beginning. As the end of the calendar year approaches, we look forward to what the next year will bring. The desire to wipe the slate clean and start anew is often palpable, but the ideas and passions of the past are never far below the surface. We experience this keenly in the ebb and flow of the Institute’s intellectual pursuits. The first GALCIT wind tunnel was constructed in the late 1920s in the newly founded Guggenheim Laboratory. It featured a World War l submarine motor so powerful that it could generate wind speeds up to 200 mph. In fact, when a hub failed and a propeller broke loose in the 1960s, the Seismo Lab registered the disturbance! Douglas, Boeing, Northrop, Lockheed, and Hughes all tested their aircraft in the 10-foot wind tunnel, as did the U.S. military. The years bracketing WWII were a heyday for the aerospace industry in Southern California, and Caltech was at its center. 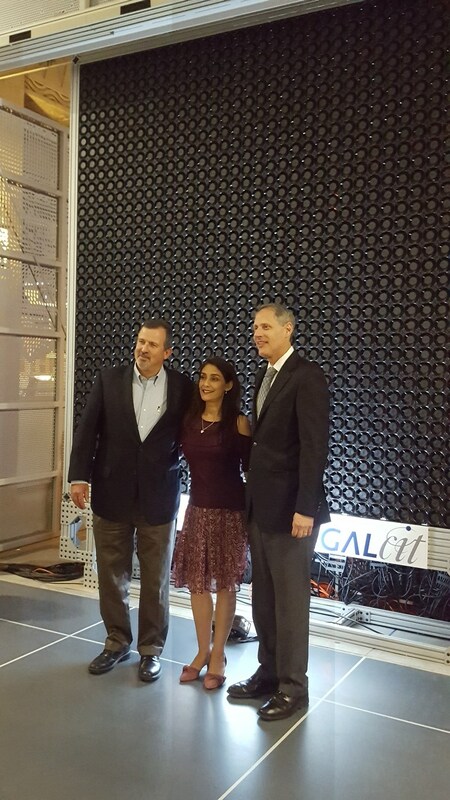 This October, we dedicated the new Center for Autonomous Systems and Technologies (CAST) in a three-story-tall test bed adjoining Guggenheim. Here robots walk the floor as drones fly through the air, cresting and sometimes falling from the sky as a 10-foot-by-10-foot wall of 1,296 independently controllable fans generates programmable wind currents. A bank of cameras mounted on the walls tracks motion to 100-micron resolution for feedback and analysis. It is in many ways the wind tunnel of the 2020s. Institute scientists and engineers are again at the center of technological change that is rippling across the disciplines and transforming industries. Completely autonomous systems will one day explore our planet and others, assemble telescopes in space, search for earthquake survivors, navigate the human bloodstream, fly over traffic jams to ferry injured patients to hospitals. Caltech’s discriminating advantage is the mastery of the fundamental science, from control theory to fluid mechanics to biological function, combined with an uncanny ability to invent instruments that open new windows on nature. Our history lives as cultural expectation. What seems the end of one notable era need not be an end, but can define the beginning of another, because the highest standards of excellence and ambition are carried from one Caltech generation to the next. We create knowledge for the ages informed by the touchstone achievements of the past. We connect to community recognizing that we are an Institute launched by the support of neighbors. May the new year be one that both escapes from and draws the best from our pasts. I wish you a 2018 of rededication, revitalization, and renewal. Copyright © California Institute of Technology, all rights reserved.